We are buying a house we have been renting for the last 2 years. It's crazy hot during the summer time. What is the cheapest and most functional solution? We live in Florida. We have been renting a home for the last 2 summers and the owners have decided to sell. We decided to buy it. We have had a few issues since living here, but nothing super major. The house has it's quirks (as they all do) and we have been able to adjust accordingly. However, The house has a huge addition that was built on in 2006 that used to be a double car garage. There is one small vent in this room as well as one small vent in the dining room, which is all towards the front of the home. There are 3 very large windows in the front of the house and in the summer time, it can get extremely hot. How to us bring 80+ in the home but especially in the front, large rooms. 2. Bought black out curtains, which I leave split in the middle because otherwise we have NO light. So, I have been considering options. For better looks, maybe one of those small wall units that has a condenser outside? Though I don't know what they would cost. Anyone else dealt with this kind of situation and have any other suggestions that I may not have thought of? To help your search, those small wall units are called "ductless systems" or "mini-splits". Here's a page about the pros and cons. It might be an affordable way to keep the addition cooled without having to redo the whole house. Would better insulated windows help? Like double or triple pane? Might be an option to price against the ac options. For under $2k, you could likely get a wall-mounted air conditioner unit to put in that space (here's an example), which would provide you a boost just for that zone (rather than requiring you to rework the HVAC in your whole house). A unit like this hangs on the wall inside and connects up to a small outdoor condenser unit using a relatively small pipe that goes through the wall -- which seems feasible for a former garage. I'd suggest calling up a local HVAC pro and seeing if they have anything similar. Add a ceiling fan along with the wall-mounted air conditioner to maximize your cooling and to prevent the cool air from pooling in one side of the room. Plant a tree (if it's not in the way of your driveway) or consider an awning system. Picture. Bubble wrap and/or better tint and insulation on the windows, covered by blinds, then curtains. Landscaping to reduce sun on the house, awning is a great idea. The umbrellas on my deck help keep the inside of the house cooler. Make the roof white or as light as possible. Powerful ceiling fan - moving air feels cooler. See if a roof vent will help hot air escape. Install an AC unit to help cool the space. So I scope and spec mini-splits as part of my job (in MA, not FL) and this situation is ideal for a mini-split. (The small wall unit with the condensor outside.) Conditioning a single add-on room like this is where they really shine. Depending on how big the area is, what kind of heat loading the room is getting in the summer, and what incentives FL offers for mini-splits, you could probably get this done for $3-6k. We (Tampa FL) just had 2 ductless mini splits put in to heat/cool our entire house (650 sf 1949 Jim Walter frame home) and they’re amazing. Total install cost like $5k, monthly light bill total about $90-100. In addition to adding a mini-split, you may also check your insulation in your attic and if it is completely empty, put in a vapor barrier and then insulate it deep, to something like R60 if possible. If it's already partially insulated, then fill it up to R60. This will make the house feel less humid, which will make it feel cooler and lower your (eventual) AC bill. To add: if it's already partially insulated, it's super cheap to buy some blow-in insulation and rent a blower to blow it in. It's just messy and working in an attic can be hot. You mention that there's one vent in the addition. Is there also an air return? I seem to remember reading that air returns in garages were prohibited by building codes (probably due to serving as a potential carbon monoxide distribution system.) Since this room used to be a garage, perhaps there's no return vent. The HVAC will work much better with a return vent/duct if there's not one. Whether there's a feasible way to run a return duct might be another story, but worth checking. We added a ceiling fan in our one big room that doesn't get cool and it helps a lot. When you write "huge" about how many square feet is the addition? Also, are the ceilings vaulted or conventional? How high are the ceilings? A mini-split is probably the way to go but adding a thermostat-controlled exhaust fan can be surprisingly effective and, if you add an AC/split-system, can really help an AC unit cope by pulling the hot air out of the highest parts of the room. I addressed a similar issue by hanging blinds off the eaves outside the house, under the theory that heat that never enters the house doesn’t have to be removed from the house. It helped, but I still ended up getting a portable air conditioner to make up the difference. I would also strongly suggest looking into a ductless mini-split. In my area (Philadelphia), they're $3500-4000 including machine and install for a top-of-the-line model (and my Mitsubishi Hyperheat came with something like a 12-year guarantee). You can get models cheaper that aren't brand-name (I'm unsure how much the quality suffers, if any). Mini-splits are much cheaper to run than normal AC because they simply transport cool air rather than creating it. No ductwork required. Inside the room, they're visually quite unobtrusive (there's also an outdoor compressor that you don't see from inside) and they're usually positioned high on the wall (e.g. like this or this). As a bonus, they also function as heaters in cold weather (in Florida, you might not need this, but nice to have as back-up anyway). They also have lots of other functions besides cooling and heat, including a fan function, a dehumidify function, a function that senses people in the room and directs air towards them, etc. I had ours installed about a year and a half ago, and have been very happy with them: the energy bills have gone down significantly and there has been zero maintenance on either of them (beyond wiping out the filter quarterly, which takes 3 minutes total). The quick and not super expensive option is to buy a window unit. But it you do, get one with appropriate oomph. A 5000 BTU unit, which is what you're going to find a lot of for cheap, probably isn't going to cut it. We have an 8000 BTU unit in our south and west facing, uninsulated bedroom, and that works well here in Arizona in the summer to boost the swamp cooler. Also, do you have a ceiling fan(s) in the room? Another issue, as you mentioned, is the amount of sun you get in the room. Blackout curtains help a *little. * One thing we've done that's helped is I've built sun screens to go over the top of the window. I built them out of 1x2"s and painted them to match the house, and I used landscape shade cloth air-stapled to the back. They look nice with the house; if I were doing it again, I'd use Suntek screen on it for more sunlight blocking, but they do help. 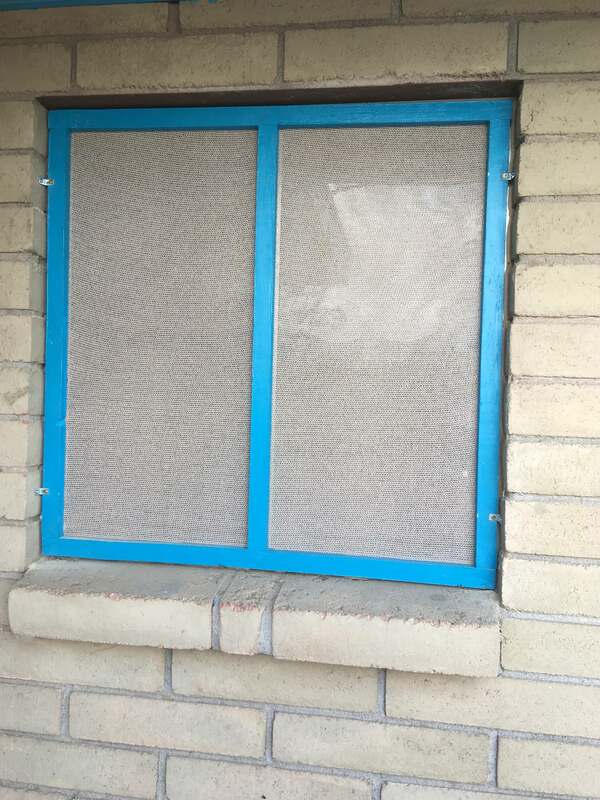 The big thing is that these screens block sunlight from getting into the house in the first place; blackout curtains don't block solar heat that's already in the house. +1 Vegetables' suggestion. Please consider adding insulation to the attic/space above the ceiling. The garage-to-living sapce conversion might not have been done properly or not done by pros all the way around. There's a fair amount of heat radiated into the room from the hot ceiling, hot attic, and hot roof. It is an easy, homeowner job. Measure the space (width) between the ceiling and roof rafters, go to Home Depot, buy rolls in same the width (either 15" or 23" wide). Be sure to buy something to protect your mouth and nose; fiberglass can scar your lung tissue. Lay the fiberglass rolls between the rafters/joists. There may be leaks about the room too. It doesn't take much to let in a lot of outside air and make you uncomfortable. There are some thin gaps around the windows and outlets and possibly between the wall and floor. Those gaps can be filled with silicone caulk (for fine, needle-width to pencil lead-width cracks) or spray foam (for gaps that are finger wide). You'll find gaps between the wall and bottom of window sill and gaps between the wall and outlet or light switch (remove the outlet plate or switch plate). The spray foam you need is low expansion. The regular stuff can expand too much and damage the wall or the outlet box.